What Is The DJI Mavic More? Is It Real Or Just An Impressive Concept? Images have been circulating on social media sites for the past few months showing a new drone called the ‘DJI Mavic More’, but is this real or just an impressive concept design by a third party? Unfortunately we have to report that this is not the next new launch from DJI but is actually the impressive work of an independent 3D designer called Wenjian Xu. He has a Behance profile where he displays his impressive work in designing concepts for new products. 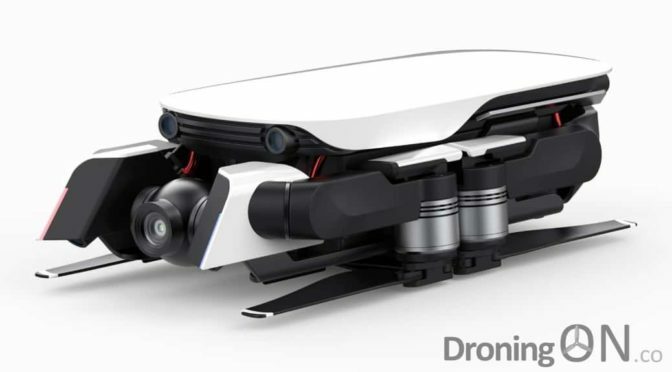 With this design, he showcases an unusual but functional looking front-end of the drone which could give rise to a Mavic and an upward-facing camera, like that of the Parrot Anafi. We contacted Wenjian to obtain some thoughts about his Mavic More concept, to understand his design path and his history and background in drones. “Hi I’m Wenjian Xu , an ordinary industrial designer based in Shenzhen in China. Like many people, I have a yearning for flying since childhood. I like drones very much, infact I assembled my own on the basis of the DJI F450 platform several years ago. Drones are still in the early stages of rapid development and technology mining is still the vane of its development. It is difficult to see a good design. The DJI Mavic Air is a great design. In my opinion, previous drone design has been referring to the design of aircraft, while Mavic Air is more referring to the characteristics of vehicles. As a design scheme of consumer electronics, it has more affinity and closes the distance between users. I like Mavic Air very much. So one day, an interesting thing happened. I wondered what would happen if I had designed this product? What would it be like to change Mavic Air’s shape on the basis of keeping Mavic Air’s soul? The DJI Mavic More concept, created by an independent third-party 3D designer. “Folding four-rotor drones has four motors and arms, and they can be folded. It is a structural appearance and a mechanical component. Since this is a difficult point to change, why don’t we magnify this feature and make it the most important one? Just like the Ducati motorcycle, make a stand-alone rack and expose it. Batteries, arms, upper cover, balcony, rear cover and so on are all fixed to this bare rack. Secondly, the camera part of Mavic Air is semi-enclosed, trying to integrate the camera and the fuselage. The starting point is good, but one point is overlooked here. The ratio of the camera part to the front face of the fuselage is not in harmony. Why not design it as open? This is also in line with the original intention of mechanization. You can view the full renderings of this impressive 3D design on the Behance website here. Feel free also comment on his Behance profile to let him know that you saw his work on DroningON – if you’re a drone manufacturer, give the man a job! Be sure to comment on this article with your thoughts, what do you like or dislike about this design and do you think that this could give DJI inspiration for future products? Previous PostVisuo XS812 GPS Drone For Under $90/£60 – Review, Unboxing & Flight TestNext PostTerrifying Mid-Air Collision Between Bird And Plane, Would A Drone Be Worse?